Never worked with it before, so time to give it a try. I will use it in a future project where I need to log sensor readings on an SD card. The code below will read the date/time from the DS1307 RTC module. Created this to verify if the clock works like expected once initialized. ; //Just wait until connected to ensure all output is shown. As this was the first time I used the module, the date nor the time was correct. This can be corrected via the ‘adjust’ function of the RTC library. 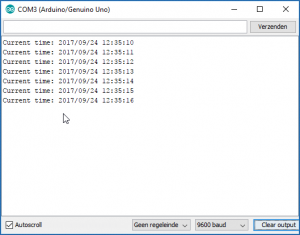 Set RTC value to current (compilation) time. Only needs to be done once (or if the clock is getting out of sync, or if the battery was unplugged). I liked this article.It was helpful. Keep on posting!